Self Catering Bungalow has large enclosed garden with direct access to beach. Brean Sands is the ideal destination for a great family holiday. With a seven mile long beach, the second longest stretch of sand in Europe, it is perfect for kids and pets. The living area is open plan. There is a Modern Kitchen with Breakfast Bar leading to the Lounge/Diner with French doors which open onto the patio. The rear garden is grassed, private, secure, and leads directly onto the beach. Seaside Bungalow has three double bedrooms and comfortably sleeps six people. Pets are welcome at no extra charge. Hello I am very happy to introduce you to Seaside Bungalow in the Beautiful Coastal Village of Brean. I was born in Somerset and live in Brean with my family and my dogs. Therefore I will be close by to help you in any way I can, and also to provide you with any local information that you may require. I provide a high standard of personal care and cleanliness and will do all I can to ensure you have an enjoyable and stress free holiday at Seaside Bungalow. I look forward to welcoming you..
Modern Bathroom with kidney shaped bath with shower unit over and adjacent shower screen. Wash hand basin and Vanity Unit. There is secure off road parking at the front of the property. Coffee, tea , sugar and milk are supplied to greet you on arrival. There is a bottle of fine wine on the table for when you are ready to relax and begin your holiday. Modern Open Plan Kitchen with Breakfast Bar. Microwave, hob, grill and oven, refrigerator, washing machine/dryer and dishwasher. Breakfast bar seating for two and dining table and chairs seating for six. Lounge, Master Bedroom and Childs Bedroom. Gardens to the front and back of the bungalow. The bugalow was perfect, we couldn't have asked for more and will be rebooking in the future. We couldn't recommend anything better having stayed locally before. Amazing. We're all sad to have come home. What an absolutely beautiful bungalow. It was clean & spacious. Plenty of room for me and my family of 4 adults & 2 dogs. The garden was massive & extremely dog friendly. We loved the fact you only had to open the gate and you were on the beach. Annette left a lovely bottle of wine for us along with plenty of coffee making ingredients. It was nice having a tv and dvd as we did have rain a couple of nights so enjoyed a film or two. We have recommended this bungalow to friends who have already booked for next year. What a wonderful place to stay with great walks, pubs & shops nearby. Thank you. Thank you Nicola for such a great review. It was a pleasure to have your lovely family stay with us and I hope we will see you again in the future. Thank you also for recommending us to your friend, who as you have said, has booked with us for next summer. Stunned when I walked in! Absolutely fabulous! Beautifully furnished throughout, so spotlessly clean, I immediately took my shoes off - seriously! Has everything you could possibly need for a comfortable holiday, right down to a dishwasher. I've never used one before so had to learn a new skill, not easy when in your 70's. A large enclosed garden was perfect for our 3 Cavaliers, who loved it to bits as the back gate led straight onto the beach. There's so much I could praise, l'II just say book it, you can't go wrong. Thank you. I am impressed that you finally got to use a dishwasher ! I look forward to your next visit with your beautiful cavaliers. They were a delight. Highly recommended holiday bungalow. Beautifully clean, tidy and homely. Dog friendly but no evidence of previous hounds. Well equipped kitchen and very comfy beds. Fabulous layout for families and/or friends. Like home from home. Beautiful views from the back garden and close to local entertainment. Annette greeted us on arrival, she has been very helpful, professional and personable throughout; from enquiry to (sadly) checking out. When we return to Brean there will be only one place that we'll be checking into. It was a pleasure to meet you all and I am always happy to see guests enjoying the garden. Annette is a great host and made us and the dogs feel very welcome. There was a nice bottle of wine and everything needed to make a hot drink - which we really appreciated. The bungalow was very clean with comfy beds and everything you could need to make your holiday enjoyable. We appreciated the bungalow was nice and warm and the shower had good pressure. The well enclosed garden is perfect for dogs with great views across to the Welsh coastline. We would definitely recommend the bungalow to others and thoroughly enjoyed our "out of season" break. Thank you Annette for a lovely break and we look forward to seeing you again. It was a pleasure to meet you and your beautiful Kerry Blue Terriers, Lola and Ava. I am happy that you enjoyed your stay at Seaside Bungalow and look forward to seeing you again too. We could not have enjoyed our trip anymore than we did, as Annette and her husband were always so useful and friendly whenever we needed their help. The bungalow was spotless and exactly as was listed on the website. 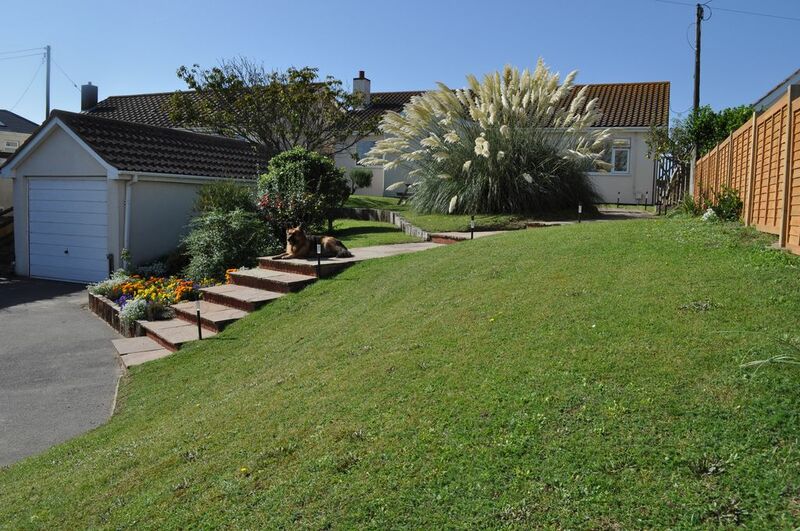 The location was very dog friendly and with the beach just at the end of the garden, it was ideal opportunity for the dogs to have long walks everyday. Thank you for your kind words. We are always happy to see you and your wonderful dogs. They are a joy and its lovely to see them having so much fun in the garden. Brean Down is a short walk along the beach and is one of the landmarks of the Somerset Coastline. There are two cafes near the beach, a small visitor centre and a bird garden. At the top of the Down is a Victorian Fort along with spectacular views across the bay. In the village is Unity Farm which has the biggest fun park in the South West of England.There is a water park that all the family can enjoy, along with both indoor and outdoor pools. There are many other attractions in the village including crazy golf, amusement arcades, ice cream parlour's, restaurants, shops and cafes. Many of the clubs offer first class free entertainment every evening. Close by are the stunning Cheddar Gorge and Wookey Hole Caves, all set in National Trust land. The Mendip and Quantock Hills are also within easy reach and makes for a perfect holiday for walkers and pet owners. Glastonbury Tor, Wells Cathedral and the Roman Baths in the beautiful city of Bath are all within driving distance.